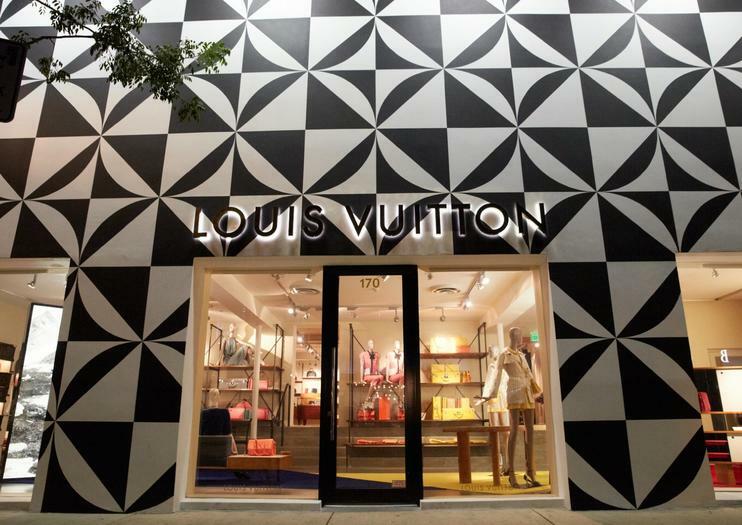 The Miami Design District is dedicated to innovative fashion, design, architecture and dining. The area juxtaposes design brands with restaurants, international art collections and permanent and temporary art installations, while its new buildings exist with transformed historic ones. Design showrooms fill the area, including Holly Hunt, Knoll, Luminaire Contract and Ann Sacks, while retailers like Christian Louboutin, Cartier, Louis Vuitton and Prada also saw the potential for the area and have opened stores here. The neighborhood continues to evolve, and new renovations continue with additional luxury brands like Givenchy, Valentino, Dolce & Gabbana, Giorgio Armani and Van Cleef & Arpels slated to open shop. The long-term dream for the district is for it to exist as a renowned destination for cutting-edge fashion, art, design and culture, while maintaining its commitment to creative experiences. The neighborhood is loosely bordered by NE 36th Street to the south, NE 43rd Street to the north, NW 1st Avenue to the west and Biscayne Boulevard (US1) to the east. The Design District is located just 2.8 miles from Downtown Miami, five miles from the Miami International Airport, and less than seven miles from the center of South Beach. Shopping hours vary but are generally from 10 am until 7pm. Taste and experience the cuisine from some of the most talented chefs in Miami as you master the art of “tapeo”! This tours involves walking, talking, drinking, and eating for a few hours as you enjoy and savor Cuban, Italian, Peruvian, Miamian, Floribbean and many other types of cuisines. • Learn about The Miami Design District pioneer as we unfold the fascinating stories about the neighborhood’s past, present and what’s coming next. • Visit the Fly’s Eye Dome by Buckminster Fuller, be impressed by the “Jungle,” and discover a formidable sculpture of the man who defined modern architecture. • Connect with Sou Fujimoto’s most acclaimed masterpiece inspired by organic eco-systems. Discover Miami in style with this 1-hour seaplane experience. This tour will take you past the main sights of the Miami skyline and Key Biscayne.See the beautifully restored lighthouse and the saltwater homes in the middle of Biscayne Bay, known as Stiltsville. Admire this collection of seven pastel colored shacks, traditionally only accessible by water, about a mile off the Florida coast.The highlight of the tour is on the return to Matheson Hammock, Coconut Grove, and the magnificent Vizcaya Museum and Gardens. You will fly low and slow enough over crystal clear water to see the exotic marine life, including red starfish, stingrays, dolphins, manatees, and sharks. This is a walking tour, so it is a good idea to wear comfortable shoes though we are covering sum distance. As with all outdoor activity in South Florida, sunscreen and hat are also recommended.Make the most of your time in Miami with this 4-hour guided tour of Miami’s top attractions. Snap pictures while walking, traveling by both train and bus. We'll start in Miami's Financial District located in Brickell to see famous building architectures and learn about historic sites/ landmarks. Then head to Downtown Miami; stop-off at a few tourist hot-spots Bayfront; followed by a quick pass-by of Port of Miami, Miami Heat Arena, Miami Marina, Museums and Freedom Tower. Finish your day by heading over to Wynwood Art District and exploring the art scene. Feel free to take lots of pictures and take notes; this way you can comeback after our tour and visit these hotpots during your vacation in Miami. See more of Miami’s highlights areas with a 3.5-hour private tour through The Magic City’s five most vibrant neighborhoods. Hop aboard a comfortable coach for the customizable ride through South Beach, Wynwood and the Design District, Downtown, Coconut Grove and Coral Gables. Take in colorful street scenes, art deco architecture and lush tropical flora, and finish at your favorite city location.